Salt Lake Acting Co.'s The Cake explores differences without demonizing. In 2019, many issues seem so volatile there's no room to explore the nuanced gray areas where they get more complicated. How do you tell a story about people who sincerely believe in an idea that has caused you or your loved ones pain? 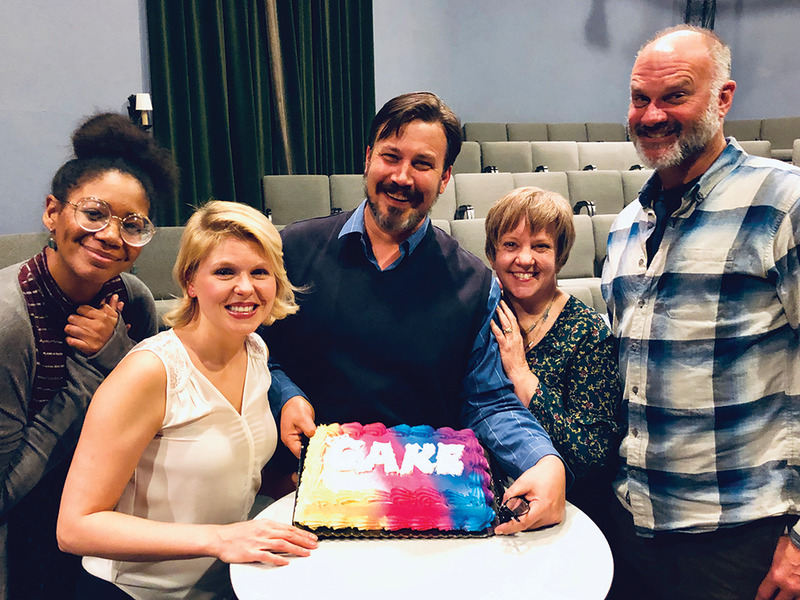 That was a challenge faced by Bekah Brunstetter in creating her play The Cake, and now by director Justin Ivie in overseeing Salt Lake Acting Co.'s local premiere. Set in North Carolina, it's the story of a devoutly Christian baker named Della (played by local theater veteran Betsy West) who faces a personal dilemma when she's asked to create a wedding cake for Jen, a young woman for whom Della has been a kind of surrogate mother. So what's the problem? Jen is marrying a woman. The premise naturally evokes thoughts of the landmark Masterpiece Cakeshop v. Colorado Supreme Court decision, which affirmed a Colorado baker's right to refuse service to a gay couple. Just as natural are assumptions about the way Della might be portrayed—especially in a play performed by a company known for progressive-themed productions. Those assumptions are exactly what Ivie—a veteran performer with SLAC, now directing his first full-length production with the company—hopes to upend. "My first impression of the text was how it kind of defied what my expectations were," Ivie says. "It's a play you think you know the moment you hear the subject. Over the course of the past few years, we've all formed opinions on that issue because of the Supreme Court case. So you think, 'Oh, it's that play.' But I noticed how little interest it has in the broader political aspects, and more in the individual, personal aspect." The centerpiece of that personal focus is the character of Della herself, who is crafted by Brunstetter in a way that doesn't make her the story's obvious villain. The near-familial connection between her and Jen forces Della to think about this decision as more than an abstract test of her moral scruples. "When this request kind of lands in her lap," Ivie says, "it's not from a stranger she can easily categorize as 'other.' We can't just write people off as something else. "Also, Della is this instantly lovable character," he adds. "It's very hard for you to dislike her just because of a decision she's making." It was important to Ivie to remain focused on that character dynamic, rather than attempting to connect it to the national news stories about similar cases. While he says he "did my due diligence" in researching the Masterpiece Cakeshop case and others like it, this isn't a story about the legal aspects of such a scenario. And it's also not one where Della is the only one whose attitude toward those with different beliefs is less than ideal, as Jen's New Yorker fiancée, Macy, has plenty of notions about Southern Christians. "[The court cases are] all useful as sort of background," Ivie says, "but we quickly moved beyond that, because the play is more interested in how do we come to truly understand the point of view with which we fundamentally disagree. Or, if not understand, at least respect." The Cake attempts to bridge that divide with a text that employs a lot of humor, which presents yet another tonal challenge: How do you get an audience to laugh along with a story about a topic that might feel deeply personal as an affront to civil rights? "People will have questions about the tone," Ivie acknowledges. "First, the play uses comedy and humor as a way to bring us into its world and get comfortable being there, but it absolutely doesn't make light about some of the very serious, hard-hitting emotional issues. These characters care deeply about these issues, more so than some of us who only think about them academically. "But I think that the key is, it's suffused with a kind of hopeful optimism about the basic goodness of humanity—seeing another human being when you're across the room from one another. It's a comedy, but I'd be shocked if there weren't tears as well." That balance in The Cake—between humor and sadness, between characters you agree with but dislike and characters you disagree with but like—is what Ivie believes will allow it to transcend being something that simply allows audiences to congratulate themselves for what they already believe. "My understanding of the opinions on the other side of mine have deepened and broadened," Ivie says about the experience of working on this show. "It's about something much larger than specifically about this issue, but how we, in a more and more divided society, use our empathy."